It's located at about 6 degrees S, 6 degrees W long. The USGS Venus crater database now refers to it as "Graham" with a "diameter" of 75 km (120 km x 45 km), although it is classified as "irregular". 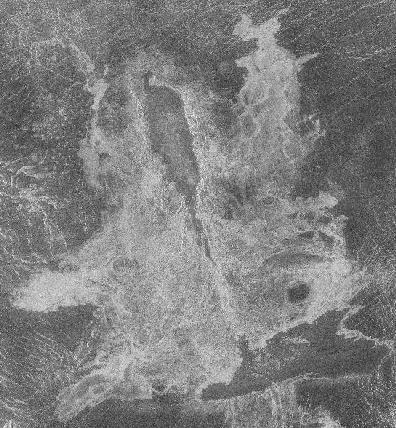 The crater itself is in the upper center portion of the radar image; the radar dark region to the south is that peculiar depression into which no ejecta appears to have landed (or the radar dark stuff came after the ejecta was emplaced). Graham's impactor may have came in from the north (north is up in the image you have). This is the Schiller crater on the Moon (180 x 65 km). 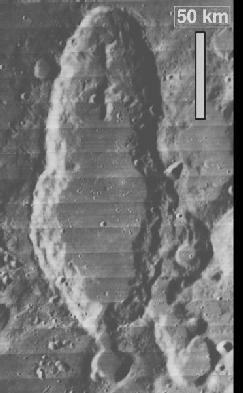 It is very similar to the "Graham" crater shown above. This is the Orcus Patera on Mars, a huge (380 x 140 km) elliptical impact at 14 deg N Lat., 180 deg. Long. Again, note the simularities between it and the structures shown above. How do you make such craters? 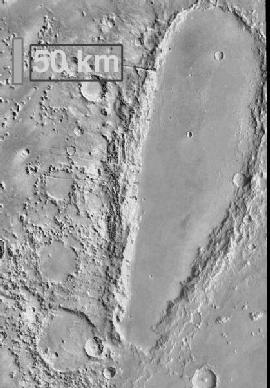 These craters were probably formed by oblique, low-angle impacts by asteroids or comets tens of kilometers in diameter. However, there are several examples on Venus of disrupted materials hitting the surface and making a real mess of things. Graham may have been disrupting on the way down; that's probably why the little crater to the north is connected to main one. The rims of Graham are somewhat scalloped (not quite as much as Schiller) and there are nasty scars downrange where smaller materials hit (possibly spalled off/decapitated from the main body of impactor(s)). Pete Schultz has a discussion on Graham in one of the Magellan 6-month report articles that appeared in JGR in 1992.